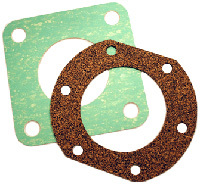 Seals & Gaskets . O-Rings . Roanoke, VA . Richmond, VA . Rock Hill, SC . Cardinal Rubber & Seal, Inc. In addition to stock seals and gaskets, Cardinal Rubber & Seal can manufacture custom gaskets in a variety of materials. If the material you need is not listed, please contact us for information about additional available materials.